It’s a wonderfully funny piece. And to those of us who follow Colbert’s work both in and out of the character he plays on TV, his final confession reiterates his own belief that it is possible to be a “functional Roman Catholic.” That’s a hotly contested claim in this cultural moment, and these are challenging days for the Roman Catholic Church. The shock of sexual abuse scandals, politically inflammatory official stances on issues from gay marriage to stem cell research, ongoing battles over the role of women in Church life, and a host of other debates— contemporary Roman Catholicism seems fraught with conflicts within the faith, and strained at best in its relations with the outside world. Even for a non-Catholic like myself, there’s something soul-crushing in watching the arbiters of such a major faith tradition acting and reacting out of a paradigm of scarcity. In his novel The Amber Spyglass, Philip Pullman calls Christianity “a very powerful and convincing mistake” (464). And when a bishop excommunicates three grandmothers for laying claim to the right to enter the priesthood (see Jill Peterfeso’s essay in this volume for the full story), I understand clearly what motivates him to say it. The Roman Catholic Church is not the only human institution with a complicated, convoluted influence on human events. But it is one of the most long-lived, powerful, and widespread. It has a large footprint. But that fact alone is not the reason for the volume you now hold in your hands. 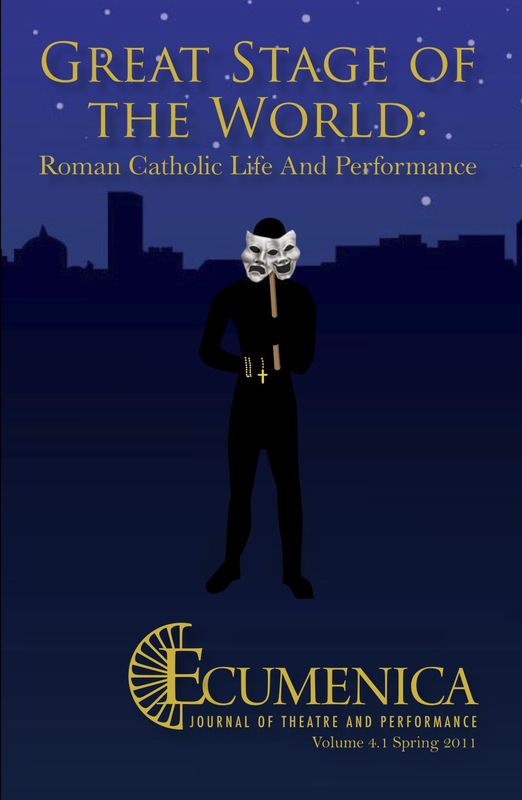 For Ecumenica, the need for a special issue on Roman Catholic performativity and drama emerged from a desire to engage with the Church community and its intellectual commentators: the people who attend Mass, who serve their parishes, who teach in schools and universities, who study the cultural traditions of the faith. We wanted to explore what it means to be an actor on the “Great Stage of the World,” to borrow the evocative Jesuit phrase. To lead the project, we invited Kevin Wetmore, Jr.—scholar, Renaissance man, ridiculously prolific author—to serve as guest editor. At the conversational table you will find priests, practitioners, and scholars; Catholics, Protestants, Atheists, Jews, Agnostics; all of us curious, and concerned, and working out how to be open to each other and to ideas. As we worked together on producing this volume, I joked frequently with Kevin that I am a poor candidate for conversion—I’m not done protesting. But whatever anyone may think about the Church’s history, its doctrines, or its hierarchy, I believe that there is much to be learned from many Roman Catholics: among saints, religious, and the laity are many who have given themselves generously in service to their fellow humans. I prefer to think of scholarship as an equally compelling act of love and service, an emptying of the self for the benefit of others. And keep in mind: this is, in many ways, an incredibly painful moment in the discourse between Catholicism and society. But it is only a moment. The Church has been around for millennia, and has every good intention of being around for many more. The Church can afford to take the long view. We may none of us, as individuals, see the longed-for opening of hearts and minds on all sides of the dialogue that ushers in the paradigm of abundance. But we are not only at work for ourselves. Scholarship as love and service is also a practice of taking the long view.